I came across Dominic Berry (Freed Up Poets) at one of Manchester's ubiquitous open mic events reading some of his poetry and thought he was interesting, but it was as a Master of Ceremony compere for a poetry night at greenroom that he really stood out as someone to watch. I wondered how I could include Dominic if the Manchester Salon ever organised anything there, as his timing and response to audience mood displayed a fabulous sense of interactive timing. With the Arts Council budget cuts forcing the unexpected closure of the greenroom, it was onwards to the Contact theatre space to get to see him perform outside of the rather hackneyed poetry reading nights. Completely authored by Manchester Literature Festival slam winner Dominic Berry, Wizard is about someone who hasn’t been outside his flat for months and a friendly neighbour called Man who visits to rapport with him. Wizard can see amazing magic in places most people can’t - a dragon ninja drag-queen scaling his shower, a menopausal midwife haunting his kettle. Based around poetic interchanges bewteen Man and Wizard, and blends this with Hip Hop, comedy, and theatre. This second R&D 'scratch' performance of the script and production follows an earlier sharing and workshop performance. I know it's Dominic's debut script but the involvement of an audience in an unfinished production with Feedback Forms, and a Questions and Answers section, to solicit ideas on what changes should be made to format and balance was a little odd. Maybe it's me and I need to get out more like Wizard, but surely this is a luxurious and inverted approach to audience engagement who surely come along to see something beyond their own experience rather than be asked what the cast should be doing? The Q&A session seemed heavily laden with a therapeutic overtone of the cast and writer wanting to be loved or guided to a better way with requests for the audience to advise them on whether to use puppets rather than physical objects. Putting that to one side for now, I thought the production was on the whole lean and mean which gave real focus to the tightly worked script and an outstanding performance by Rod Tame as Wizard. Although I say the script was tightly worked, it was inherently confused, contradictory and somewhat unbalanced in terms of character roles. 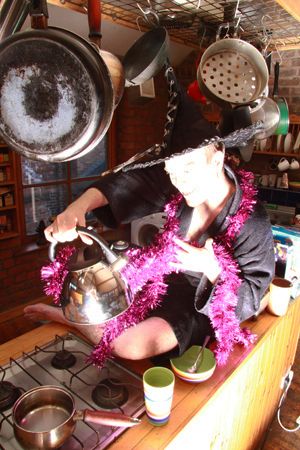 The story has two characters essentially - firstly a guy called Wizard (played by Rod Tame) who imagines he's a wizard and stays in his flat to engage in conversation with his kettle (Ursula), toaster (Catherine) and dish rack (Daisuke) all spoken by Jo Warburton, and secondly an ordinary guy called Man (played by Dominic Berry) who has a job and work colleagues he thinks of as dull but aspires to be poetic and rhyming like Wizard. The two characters of Wizard and Man are scripted to have little existence outside of their relationship with each other, and that relationship is one whereby Man is friendly towards Wizard in a neighbourly way, but underlying the relationship is a yearning by Man to be as clever and wordy as Wizard, whilst Wizard tolerates Man coming to see him partly because of the flattery but also because he provides sustenance of shopping and domestic chores, including beverage via Ursula the kettle. Man is an ordinary guy in an ordinary job, but with aspirations to use his intellect and imagination to explore the world of words and go beyond the mundane existence of his work with rather mundane work colleagues who don't appreciate him and his talents, so spars with Wizard to hone and improve his craft. Man's character is less imaginative than Wizard and replicates Dominic's performances, and many a public performing 'poet' at open mic events - good wordcraft but delivered through a rather hackneyed format and posture. By contrast though Wizard's character is truly imaginative with superior wordcraft, delivery, situation and dynamic - developing rapport between the characters he imagines for the inanimate objects he gives voices and personalities to, well beyond the spontaneous capabilities of Man. As an aspiration of imagination and will, Wizard is a delightful symbol of capability, but the reason for his forced imprisonment in his flat through the script, apparent self-imprisonment of character becomes clear as the story unfolds. The character that expresses excellence and control - in this case of language, does so because he has mental health issues. The essential problem with formulation is the contemporary view of both aspiration for excellence and mentall illness go hand in hand - one drives or tends to the other and vice versa. Up until very recently, views of ambition and imagination were considered a normal part of everyday life and in no way connected to mental illness. Increasingly popular views in political and professional life tends to emphasise a continuum from mental wellbeing to mental illness and it's really only a matter of degree or severity that incapacitates someone. An articulation that demarcates ordinary states of being from mental illness is more often these days seen as perjorative and unhelpfully labelling mental illness as something to avoid, with more people almost promoting the labels they have been assigned or even assign to themselves. So we have a situation in this play where Man aspires to be like Wizard that is aspiring of the thing that leads to mental illness or is given by mental ill health, rather than aspiring to a highpoint of human excellence, like mastering language, that's just a normal part of everyday life. There was another interesting aside in the play that sees the Department of Employment (am I dated or what?) visit Wizard at home and comes on super therapeutic in trying to understand his condition and what caused it, drawing in other therapeutic services of the State to help draw Wizard back into society, yet in an inadequate way. The only feeling we're encouraged to feel here is that the State should be more interventionist and all encompassing of our ordinary lives. Thanks, but isn't this diminishing of our own capacities as adults to cope with the big bad world, the very reason why so many call for more State intervention without any end to its scope? I got back home from the performance to see a posting on Facebook by a master of timing, master of wordcraft and stand up comedy Timandra Harkness who alerted us to the way Culture is very consciously being promoted in a therapeutic fashion to improve our health - see Culture linked to improved health on BBC website. I'm not sure what the brief for the Arts Council to fund this play was, but it was certainly bang on the money for the contemporary viewpoint that indicates we're all vulnerable to mental health illness and probably need more State intervention in our personal lives to help prevent it. The technical structure of the script, despite its politics, was excellent and the performance of Wizard was superb so worth going to see if you can distance yourself from the message. Editors Note: Whilst we're on the subject of the relationship between art and politics, the Manchester Salon organised a discussion entitled 'Valuing the Arts' looking at 'how the arts sector can ensure quality in the midst of dramatic budget cuts' in June 2011.